With the coming of the New Year, as it had been in many of our “developed” cultures in times past, each family of the Campo greets the other families wishing them well, and this year the Moposita family was the first one out of the shute, as it were. It must have been 10 or 11 in the night when we began this New Year’s version of the custom of serenading the surrounding families. Keep in mind that we had been flying with Pajaro Azul since mid-afternoon, so it took major commitment from the entire goup (5 of us) to hang together on pitch black footpaths or trampling through cornfields, finally stumbling into courtyards of the families nearby. As soon as we arrived, though not silently what with the barking dogs, honking geese, and our own laughter, we began to sing and play this song. Or, in my case since I didn’t know the words, kind of hum and moan and clap my hands, which actually I was pretty good at. Well, that’s how I remember it anyway so I’m sticking to my story. The other part of the tradition requires that each of the families being serenaded bring out yet more cerveza (beer) and/or Pajaro Azul. 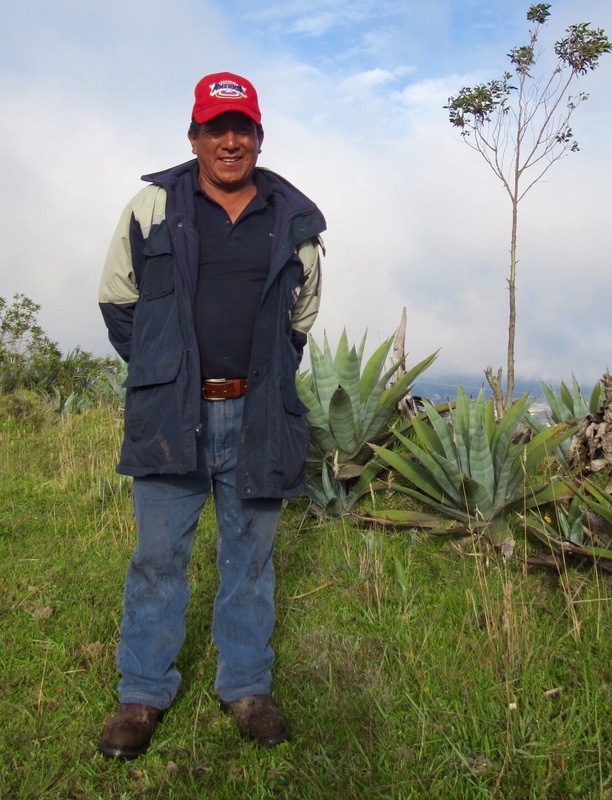 This being the campo, and like virtually all farming communities worldwide, folks are early to bed, early to rise. So when the lights turned on in the houses we visited, and the head of the household appeared in the courtyard with a glass and the booze, imagine his, or occasionally her, surprise to see a gringo in the midst of the neighborhood troubadors! Most were quite taken aback, and one or 2 even stumbled in surprise, but none paused in pouring out salutes to health and good harvest. A good time truly, was had by all. Yet while the campesinos had either started or were soon to start celebrating good fortune and bountiful harvest in the new year, it was anything but good fortune for the pig. His year was starting out badly and went downhill from there. Jefferson’s father had arrived home well after midnight, having begun the celebrations with friends in other places. We had brief introductions as I was headed off to bed. He seemed to be struggling with the remembrance of just why this tall gringo was standing in his house. He wasn’t angry by any stretch, the Blue Bird sings songs of love, though he was sorely and profoundly puzzled. But while I was soundly asleep, snoring and drooling, he was sharpening his killing blade. After the deed, and the singeing of the hide with his plumber’s torch, his work was done and the women’s had just begun. His wife began first by scraping the hide, gutting and then sectioning the carcass. She, with help from an ever-changing number of daughters, spent most of the day first butchering then cooking the pig in a gigantic wok-type of pan/pot/whathaveyou. While she was building up steam for the task ahead, Jefferson’s father (I never did learn the names of Jefferson’s parents) took me with him for an early-morning wake-up over at his neighbor’s place. As we walked over there, he explained to me the purpose of a gulley that was obviously hand dug along the top of the ridge we followed. I had seen it earlier and thought it curious since it appeared to me as if it were a revetment, designed for fending off invading barbarians. The reason, though not so exciting, was still interesting. This ditch is the traditional way for the indigenous families to mark off boundaries between their separate properties. I’m thinking that few of the lands here are registered with any governmental agencies, and surveyors be damned, so this is an effective way for clear and permanent delineation between neighbors. At the neighbor’s house we were offered the red-eye special: fried chitlins in choclo with an aji salsa that cleans the rust from your pipes, washed down with, of course, more booze! Choclo is one of about 7 different types of corn grown in Ecuador. The kernels are huge, the spherical size of a nickel or so, and the aji (pepper) salsa is unique to each family and having grown up with hot and spicy food, hit the spot. Beer for breakfast? Not so exciting, but customs in the hills developed for good reasons and it was not for me to question. Back at the house the family was split into 2 factions with one group up to their elbows in pig and the other group getting ready for Guaranda’s Carnaval. As the honored guest, my role had already been defined before I even arrived from Quito, so I boarded another death-ride taxi for a pell-mell dash down the mountain to town. By now it was mid-morning and the parade had already begun. So we squeezed in amongst other revelers to take in whatever happened next. And what happened next was a traffic jam. A mile from town the dirt road, and all the other ways into Guaranda were blocked. Cars, and more often trucks, handcarts, and the ocasional dumptruck(?) were haphazardly stacked up, one behind or beside the other, so we abandoned the taxi and boosted the children on our shoulders, making the last part of the trek on foot. The city streets were awash with parade-goers and certainly the party was in full-swing. Before leaving Quito, my host family had provided me with an image of mayhem and wild destruction awaiting the unwary wanting to see a true Andean Carnaval. And in the years past, when both my generation and ones following took part in the festivities this was truly the case. 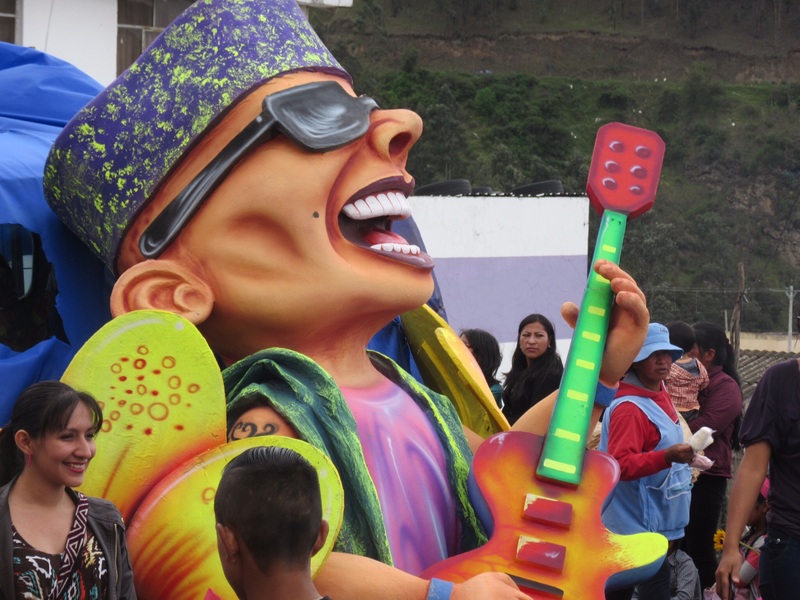 But Ecuador has cleaned up its festivals so in comparison to days past this Carnaval was almost genteel, though not quite. People of the Andes have for centuries marked the new year with blood all-round. 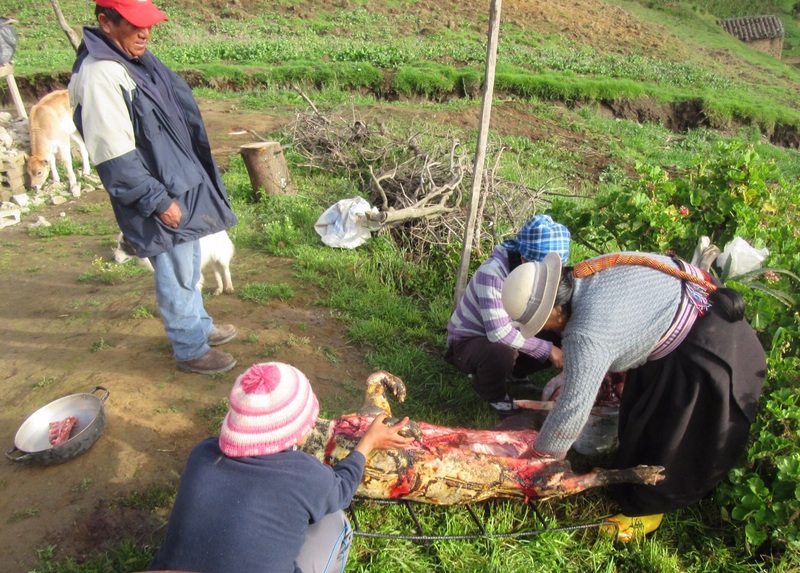 The killing of the Moposita Family pig was certainly part of it, and from the squeals coming from other campesino family compounds it was easy to tell that they too added their parts to the rituals. Though community Carnavals are where this is most evident. 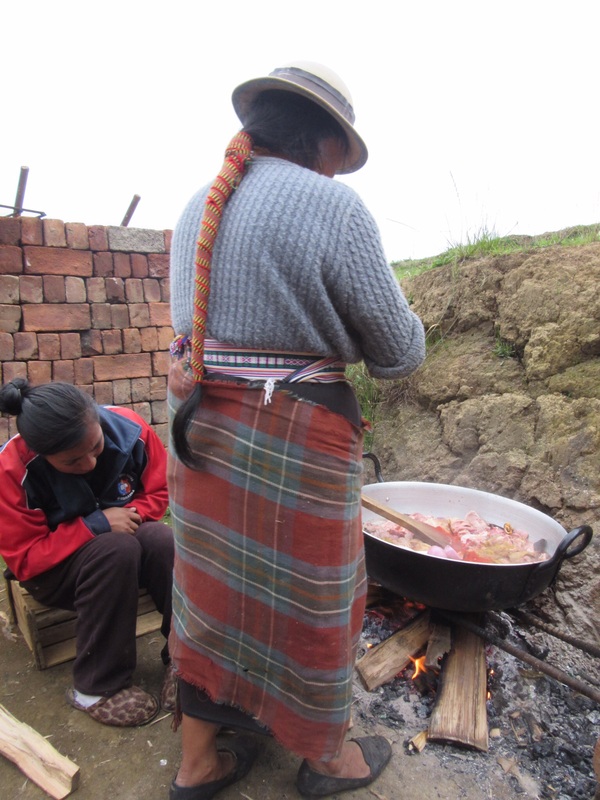 In days past, and still in many parts of Peru and Bolivia, ritual blood-letting was/is not only accepted but strictly enforced. Rival teams of men and youth would confront each other throughout the Andes and trade blows to the head with the expectation that resultant flowing blood would supply Pachamama with the energy she needs to ensure the harvest of the New Year. I’m glad that, at least in Ecuador and Colombia, things have toned down a bit. However I was warned that instead of flowing blood I could and should expect raw eggs along with flour missiles and water bombs. So I came prepared, decked out in full-body rain gear, virtually head-to-foot in rubberized clothing. Man, was it hot! Well this year, the eggs are gone, the flour use is pretty trivial, and what is the weapon of choice, excuse me, the expression of joy, is shaving cream; boatloads and boatloads of shaving cream. But not your store-bought Schick or Gillette cans of personal grooming. There were hawkers parading up and down the street between us, the beer vendors (by the glass or the case), umbrella sellers, and the actual parade participants, selling aerosol cans 18-24” high, and packed with high-pressure shaving cream. These cans allowed the gunners using them to float a focused stream of shaving cream 20 or 30 feet into the crowd. Which they did. We, all of us, found it in our hair, faces, front and back, down the back of the neck. Then there were the youths on the roofs of the buildings above us: ready, willing, and quite able to drench all of us with water balloons. And they too did, often and with great accuracy. The actual parade was itself almost a distraction from the aerosol snipers, the overhead water bombardiers, and the drunken couples dancing, stumbling and falling to music from the mega-decibel salsa sound trucks slowly driving by. We saw the obligatory beauty-queens, the hand-made floats crafted during the past year by local artisans, and marching dancers. Or was it dancing marchers? We saw groups of made-to-be hippies of the 60’s, with flourescent hair, wearing costumes from the disco 70’s, we saw tractors pulling memorials to the workers’ cooperatives, we saw elite troups of military and police brigades. And then it rained. And then the rain began to freeze. And then it hailed. And with mild panic, the crowd ran for cover, while the bands played on. There was at least one aging gringo who was glad for his full-body rain gear. We finally squished our way back to the house where we became one with the New Year pig at the dinner table, sang a bit and went to bed early for a 3AM bus ride back to Quito. Since then, as I consider what transpired I realize that though the Guaranda Carnaval was an enjoyable, though truly frigid experience, what was of greater meaning were the events in el campo. It was a true privilege being welcomed into the Moposita Family home. Though I was more than a bit uncomfortable sitting at the place of honor during meals, I knew that each of the family members freely and unconditionally wanted me to feel at home, to be one of them. And really, I did. 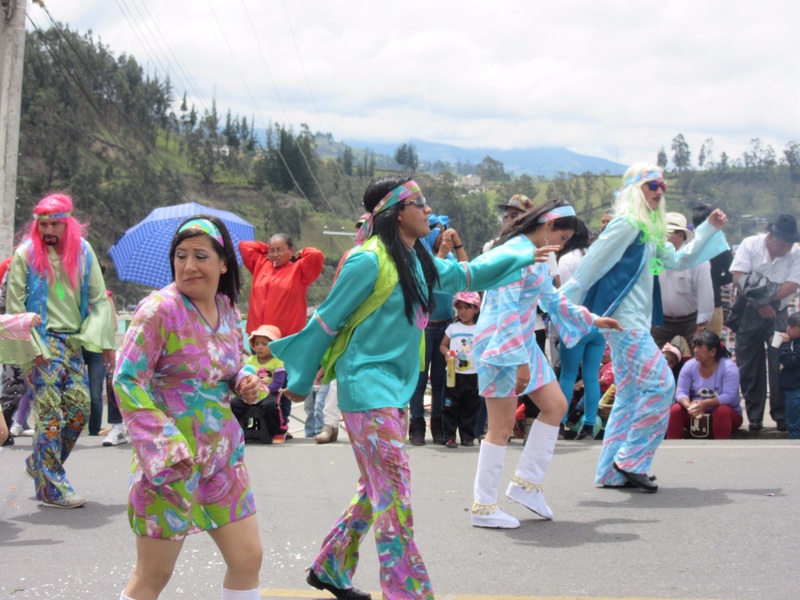 This entry was posted in Uncategorized and tagged Carnaval, Ecuador, Guaranda, indigenous, Kichwa, Kitchwa, Quechua, Quito on 2015-03-01 by kmalivuk. What an experience! Hope you had a chance to wash some of that celebration off before getting on the bus. My breakfast group enjoys your posts and I read them to Molly. I’m so glad that Molly can be part of the trip. I was really touched when she said goodbye. And the best to your Friday boys, we’ll get together some time and trade stories. Amazing recollections these! I want audio says the girl with a mouth full of gimme and a hand full of much obliged! I’ve thought about video once or twice, but audio jumps up several notches. This boy’s still learning to crawl, but I learn every day that the future is beyond prediction. Stay tuned and Hi to Bill! You’re crawlin’ real good there, fella. Speaking of crawling, how’s your foot? Cast? Crutches? Guess its not too bad if you’re headed south with Frank. Keep ’em coming hombre. You’re good at this. Hi Karl, must say you missed your calling in your past years. I truly enjoy your writing. Very descriptive and feels like I’m there experiencing your journey with you. I thank you. I’ll never go to South America like you have so, it’s exciting for me to visit through your eyes. Very exciting. Forgot to mention your wonderful photos too. Happy for you. Lena, I go everywhere with both notebook and instamatic. Each feeds ideas to the other and I’m just there to stitch the 2 messages together. Don’t touch that dial. What a tremendous adventure, Shanon and I have been following from the getgo! The new cultures and mores you’re experiencing are fantastic. We look forward to future posts. Tomorrow night a good friend is arriving from Albuquerque and we’ll be headed south (Cuenca, Loja, Cotopaxi, etc) for a week or so. I expect to harvest some ideas while on the hoof. Thanks so much for stopping in.